I've always wondered what I've been missing by not featuring ads on my blog. So, on September 1, when you weren't looking, I fired up Google AdSense and slipped it onto my sidebar just to see what would happen. Here's my net earnings after 30 days (in the lower right corner). Heh... you know that job I've been trying to get? That's right, I can stop looking now because I'm headed for the easy life! Ok, eventually. Apparently Google doesn't pay out until you've earned at least $100, so at this rate I won't see my first dividend for another 6.8 years. But you can bet I'll be making plans for that sweet sweet day. Oh yeah. Wow ! You can actually make money there ? I don't know how it all works but it's nice to know ! With will $100 be worth in the next 7 years ?! Jeff, your blog isn't conducive to making money with Adsense because the topics are varied. I made that mistake with my farm and family blog. You need a money blog. Then you have a few posts per page. 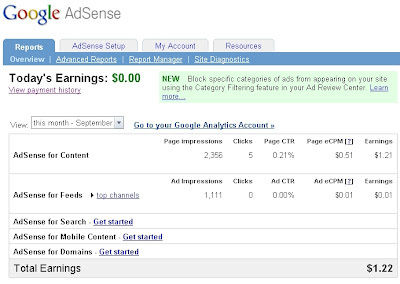 Adsense will zero in on the topic item and you will get accurate ads and lots of clicks. I did that with my TodaysGizmos.com blog, and started making money. I haven't posted in a very long time (except for a quickie today because someone contacted me and asked me to review a product they wanted to send me, and not one to turn down free stuff I obliged) but I was and still am getting some Amazon money and Google Adsense without doing a thing!! I am not getting rich on it but it's free money. jaffer - I'm gonna convert all my earnings to gold, and then send it to that cash for gold guy on TV for a way bigger payout. windyridge - What do you mean my topics are varied? Yesterday was my 8th poop post. Surely Google should be able to smell a streak like that. Yeah, I hardly make anything even on my BlogHer ad, but it is something so I keep it there. Adsense I made ZERO, so hey, you made more than I did! My sister makes a little more than that on her blog with BlogHer, but I'm with you in that I'm never going to make money on mine, because I'm too "varied" too. I mean, a title like "Unfinished Rambler." How do you get more varied than that? Wow! You made $1.22 from Google AdSense! Be sure to blog about it. I've made about $30 with Google over the past 2 years, tho I haven't had ads up for nearly that whole time. But $30 is enough to make me want to keep them up there so I can get my $100. When I'm 80. I ran Adsense for a while way back and I made a whole $0 so you are doing well! heather - I can't say I'll keep my ads there much longer. Don't really need them cluttering up the sidebar and they also cause my page to load slower. unfinished rambler - You're right. It's too bad more people don't appreciate the poop. janna - I love it. Written in true Jannaverse. Thanks! jd - You didn't even try to do that math on that... lazy. Unless you're already 75ish. But it does look like you'll hit your $100 before me. We should plan for a big vacation somewhere really cool where we all spend our $100s. babs - Yeah, but did you covert that $0.00 to British pounds? ve - How would you feel about them if I donated all my earnings to you? I had the ads for a while just to see what products and services they matched up for my posts. Most of them were of the "Meet Real Cheating Housewives" variety. I would take down the pic before google cancels your account. The only people getting rich off Adsense are already working for Google. I have no idea what I've made (obviously WAYYY less than $100), and I think I'm happier not knowing. But you -- you already got a double cheeseburger from McDonalds and that's not even in a month. Of course by the time you're at $100, that's probably too many cheeseburgers to eat in one sitting, isn't it? Hah! I can't be bothered... I shall forever blog gratis.